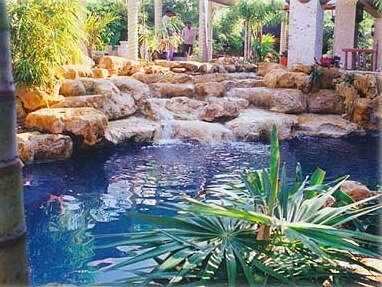 From Coral Gables to Biscayne Bay, south to the Ocean Reef Club and Key West, north to Palm Beach and Jupiter Island...this is where we established our reputation as South Florida's most versatile builder of swimming pools, spas, fountains, waterfalls, rockscapes and water features. Our motto is: only perfection will do. Some recognizable *RESIDENTIAL* clients: Alonzo Mourning, Cher, Coach Jimmy Johnson, Coach Pat Riley, Dan Marino, Dwayne Wade, Gloria and Emilio Estefan, John Secada, Madonna, Oprah Winfrey, Paulina Rubio, Penny Hardaway, Rosie O'Donnell, Shawn Marion, Sylvestor Stallone, and Tim Hardaway. We pride ourselves not only on the projects we have built but also on the long lasting relationships we have developed with our clients. Some recognizable *COMMERCIAL* clients: Espirito Santo, Fairmont Turnberry, Fisher Island Private Residences & Resort, Fountainbleau Hotel and Condominium, Graham Companies, Hyatt Hotels, Intercontinental Hotel, Jupiter Yacht Club, Ritz Carlton Hotels & Condominiums, Sunset Key Island Private Residences & Resort, and Westin Hotels & Resorts.